Toshiba Electronic Devices & Storage Corporation (“Toshiba”) announces a new range of video interface bridge devices intended for modern automotive In-Vehicle Infotainment (IVI) applications. Increasingly, Systems-on-Chip (SoCs) from smartphones and tablets have been used in automotive applications as IVI systems became more sophisticated, requiring more functionality and greater performance. However, due to differing connectivity standards on devices such as displays, existing SoCs often lack of necessary interfaces required for automotive networks. 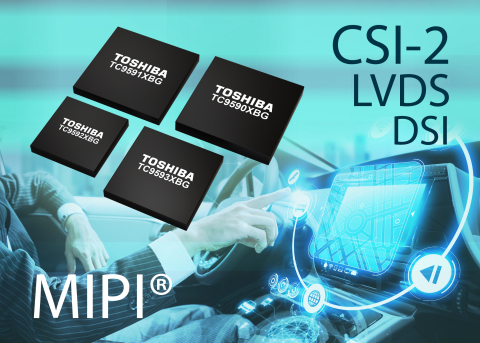 Toshiba’s new range of video interface bridge devices provide HDMI to MIPI® CSI-2 (TC9590), MIPI® CSI-2 to/from parallel (TC9591) and MIPI® DSI to LVDS (TC9592/3) connectivity. The devices are offered in 0.65mm pitch, VFBGA packages between 5 x 5 mm and 7 x 7mm, with the exception of the TC9590 which is housed in an LFBGA64, 0.8mm pitch 7 x 7mm package. The TC9592, with its single link, 5 pairs/link LVDS output is suitable for connecting SoCs to a UXGA 1600 x 1200 24-bit display. The TC9593 provides a dual link, 5 pairs/link LVDS output, making it ideal for displays up to WUXGA 1920 x 1200 in size. The TC9591 can be configured to convert 24-bit parallel data at 154 MHz to 4-lane MIPI® CSI-2, or MIPI® CSI-2 to 24-bit parallel data at 100 MHz. The TC9590 supports HDMI 1.4a at its input and 4-lane MIPI® CSI-2 at its output. All of the devices operate from -40°C to +85°C, although the TC9591XBG extends the upper limit to +105°C. Toshiba has a long history in developing MIPI®-based interface bridge chips for consumer applications and have drawn on their experience in this area while developing the new automotive IVI range. Sample shipments of the new devices start this month. HDMI and the HDMI logo are trademarks or registered trademarks of HDMI licensing in U.S. and other countries. MIPI® mark and logo is registered trademark of MIPI® Alliance, Inc.